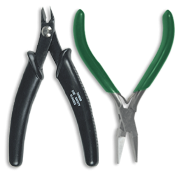 Find professional quality cutters & pliers for any jeweler's toolkit! Shop flat, round & chain nose items, stone cutters & more. Perfect to work with even on small jewelry pieces. Get the best prices thanks to our regular discounts!